Closely based on last year’s stunning GTC Paris concept, the production Vauxhall Astra GTC enters the UK market – the biggest in Europe for this model - priced from just £18,495, nearly £1,100 less than the basic VW Scirocco. Dramatic design will set it apart from rivals – as will sub-£18.5k entry price! Luton – These are the first official shots of the new Astra GTC, which will lay down the gauntlet to VW’s Scirocco and Renault’s Megane Coupe with a heady mix of dynamic excellence, dramatic design features and competitive pricing as order books open at Vauxhall retailers today. Closely based on last year’s stunning GTC Paris concept, the production Astra GTC enters the UK market – the biggest in Europe for this model - priced from just £18,495, nearly £1,100 less than the basic VW Scirocco. But even in entry-level trim, the Astra GTC adopts the sophisticated front suspension from the Insignia VXR, featuring Vauxhall’s HiPerStrut (High Performance Strut), combined with the clever Watt’s link rear axle for unmatched stability and handling precision. The third body style to come off the new Astra’s Delta platform (following the Hatch and last year’s Sports Tourer), the only elements the GTC shares with its siblings are door handles and the roof aerial – even the wheelbase and tracks are different. Brit, Mark Adams, Vauxhall’s Vice President of Design, has aimed to create a car that looks like it’s been plucked from the class above, with its low, wide stance and simple, yet rakish lines. But don’t be fooled: the GTC’s ‘straight-from-concept’ looks shroud a cabin that’s roomy and comfortable enough to accommodate four adults and their luggage. So while the GTC will appeal to UK car enthusiasts, its practicality will ensure that it accounts for around 20 per cent of all Astra sales when it arrives in UK showrooms towards the end of this year. The GTC will receive its world premiere at next month’s Goodwood Festival of Speed (July 1-3), reflecting the importance of the UK market to this model. 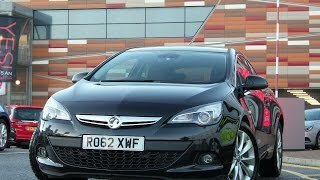 Right from the start of the Astra GTC’s development the target was to deliver a focused and driver-orientated feel to the car, and one that worked well on UK roads. As a result, significant changes were made to the front suspension, including the adoption of Vauxhall’s HiPerStrut (High Performance Strut) used on the 325PS Insignia VXR. Much proving work was also done on British roads by engineers from Europe and VEC (Vauxhall Engineering Centre) to hone the car’s damper and steering performance, recognising the unique nature of our road network. The HiPerStrut uses the existing attachment points from the regular Astra, and has a reduced kingpin inclination and a shorter spindle length. This reduces levels of torque-steer, improves grip – and therefore cornering power – while also enhancing steering precision and feedback. At the rear, the GTC continues to use the compound crank with a Watt’s link that has been employed with such success on the Astra Hatch and Sports Tourer. This unique and innovative combination is far more compact and light weight than a multi-link set up, while providing excellent control and stability, as well as excellent noise insulation. Compared with the Astra Hatch, the GTC’s ride height has been lowered by 15mm, while the wheelbase has grown by 10mm, from 2685mm to 2695mm. Both tracks are wider, too, at 1584mm (+ 40mm) front and 1588mm (+ 30mm) rear. This allows the option of larger rims (up to 20-inch), as well as improving stability. 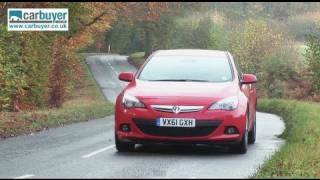 Enhancing the GTC’s chassis still further is the option of Vauxhall’s FlexRide adaptive damping. FlexRide automatically adapts to prevailing road surfaces and driving styles, providing drivers with fully optimised handling, even in the event of an emergency situation. In addition, FlexRide offers a choice of three settings – Standard, Tour or Sport - which will change the car’s character on demand at the push of a button. Since the Astra GTC shares no body panels with either the Astra Hatch or Sports Tourer, it has a unique appearance in the range, and one which has largely stayed faithful to last year’s stunning GTC Paris concept. In profile, Mark and his team created tension in the GTC’s shape by minimising the lines running along the body. Vauxhall’s signature blade, a crisp line that sweeps up from the rocker at the front of the door, is now similar to the Insignia’s, but runs the opposite way to other Astras. A second line strikes through the door handle, stretching to the rear, while a third line follows the roof’s profile, guiding the eye to the sharply integrated spoiler. At the front of the car, a centreline crease is complemented by slim, ‘eagle-eye’-style headlamps featuring wing-shaped daytime running light graphics. A chrome emblem bar running across the dramatic trapezoidal grille – mounted lower than on other Astras – completes the picture from the front. The GTC’s rear treatment is equally dramatic. Its powerful shoulder section gives the car imposing proportions and a purposeful road presence. The line from the C-pillar wraps around the tail and the rear spoiler, which integrates with the roofline. LEDs – optional across the GTC range – highlight the stretched ‘wing’ motif created by the tail lamps. 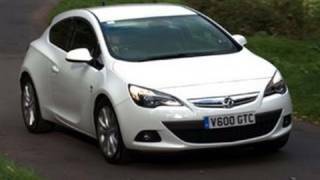 The Astra GTC can be ordered with a choice of four engines – one diesel and three petrols. With 165PS, the 2.0 CDTi is an upgraded version of the diesel that’s fitted to some models in the Insignia and Astra ranges. All engines have a diesel particulate filter, six-speed transmission and Start/Stop as standard, maximising economy and performance. Delivering 380Nm of torque (including overboost function) the 2.0 CDTi engine provides excellent mid-range acceleration for the GTC, combined with a 0-62mph time of 8.9 seconds and a top speed of 130mph. That torque also allows the GTC a relaxed cruising gait, meaning a combined mpg of 57.6mpg and C02 emissions of just 129g/km. It also gives drivers a range potential in excess of 700 miles. Start/Stop and a six-speed gearbox are also standard on both versions of the 1.4-litre Turbo petrol engine. With either 120PS or 140PS, the 1.4T achieves a combined 47.9mpg and 139g/km of C02 emissions, yet each still delivers crisp performance with maximum torque of 200Nm delivered between 1850-4200rpm. The most powerful engine in the range is the 1.6-litre Turbo, which produces 180PS and allows the GTC to hit a top speed of 132mph. In 2012, a high output VXR model is set to wow British hot-hatch enthusiasts – more news on that later in the year. Don’t be fooled by the GTC’s swooping lines and sporting looks: unlike many of its competitors, functionality has not been compromised. Not only can the GTC accommodate four adults in comfort, but its luggage compartment provides between 370 and 1235 litres – over 200 litres more than some of the competition. In line with the current Astra, storage volume in the cabin has also been improved by 50 per cent over the current model, with items like the standard electronic park brake liberating space around the centre console in every GTC. Standard equipment is generous no matter which GTC model customers choose. Even in entry-level Sport trim, the GTC comes equipped with 18-inch alloy wheels, DAB stereo and USB functionality. Move up to the top-spec SRi, and buyers get as standard tinted glass, onboard computer, leather-trimmed steering wheel and fog lamps. The latest generation Bi-Xenon Advanced Forward Lighting (AFL), which offers nine separate light beams, is optional across the range. A range of new colours and materials, bespoke to the GTC, set the car apart from others in the Astra range. Morello Red, a new premium leather trim, is also available as an option and brings with it six-way adjustable front seats.